Last July this column asked the question, “What do you call that lake?” as we reviewed the history of the large body of water in southern Pekin that has been known successively as Bailey’s Lake, Lake Arlann, and now Meyers Lake. This week we revisit that question, presenting one or two pertinent facts that have come to my attention. The lake first came to be known as Bailey’s Lake around the mid-1800s because Cincinnati Township pioneer settler Samuel P. Bailey (or Baily), a Pekin attorney, owned a couple parcels of land along the east and west shores toward the north end of the lake. This photograph of Bailey’s Lake, a copy of which is preserved in the Pekin Public Library’s Local History Room collection, was probably taken circa 1890, perhaps by Henry Hobart Cole. Coal mining and ice harvesting were big business at Bailey’s Lake until the middle of the 20th century. Afterwards, real estate development at the lake in the 1950s brought the new designation “Lake Arlann,” after the developer, named Arlann, who added some new subdivisions at the lake. Finally, a few years ago Tazewell County plat books and online maps of Pekin began to show the lake’s name as “Meyers Lake” instead of “Lake Arlann.” It’s still not clear how or why that name-change came about – but recently I chanced upon a bit of information that shed a little more light on the “Meyers Lake” designation . . . but also makes things a bit more complicated. As an aside, “Shaferville” is properly known as “Schaeferville,” which is the subdivision’s legal name and the way online maps spell the name – but the latest Tazewell County plat book has “Shaferville” just as Drury showed in 1954. The family for which it is named spelled their name “Schaefer,” however. And now, according to the official Tazewell County plat books, and according to Internet maps of Pekin, it’s again called “Meyers Lake” (seemingly having misplaced its apostrophe in the intervening decades while the lake was known as Lake Arlann). But the question remains: Why “Meyers” Lake? What do you call that lake? Just a few blocks south of Pekin Community High School’s Memorial Stadium is the north end of a natural, spring-fed lake used for boating and fishing by homeowners who live along its shores. And until 2012, they’d have been right. The reason for the name change is unclear, nor have I yet determined who filed and approved the new name, nor why “Meyers” was chosen as its name. Presumably it’s related to the expansion of real estate development in the area along the lake’s southern and western shores in recent years. 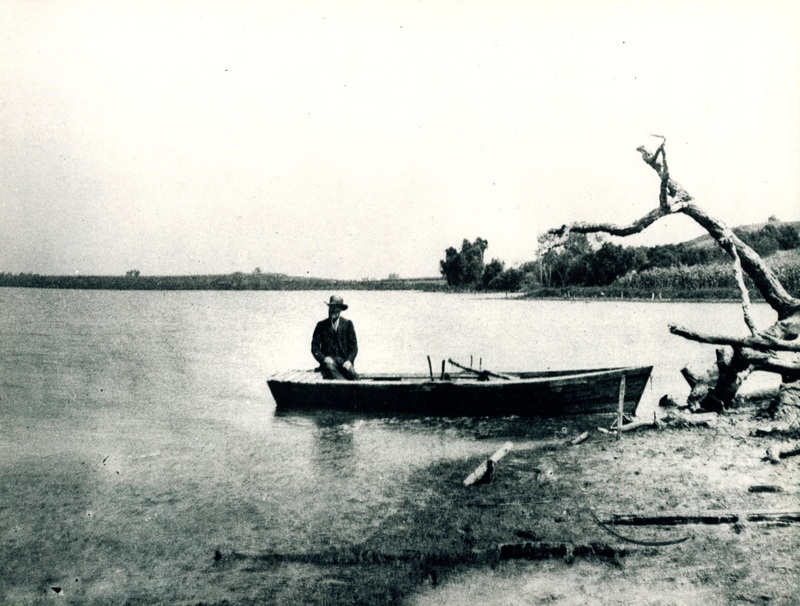 This photograph of Bailey’s Lake, a copy of which is preserved in the Pekin Public Library’s Local History Room collection, was probably taken circa 1900. The map of Pekin in the 1949 Pekin Centenary volume give the lake’s name as “Bailey Lake,” but the oldest Tazewell County maps and atlases call it “Bailey’s Lake.” Before Lake Arlann became a place for recreational boating and fishing, Bailey’s Lake was the location of the Grant Brothers ice houses during the first half of the 20th century. Grant Brothers used to have a switch track that carried harvested ice from the lake during the winter up to the New York Central Railroad, which carried Pekin ice across the country for use in families’ ice boxes in the days before electric refrigeration. There were also coal mines dug into the bluffs and hills near the lake. But with the end of ice harvesting and the decline of coal mining in Tazewell County, the land around the lake was redeveloped in the mid-20th century as prime real estate for people desiring a lakeside home. With that redevelopment came a new name – though, again, I’ve not determined why “Arlann” was chosen as its name. The LAHA website sheds no light on that question. We do know, however, why the lake was long known as “Bailey’s Lake.” One of Cincinnati Township’s pioneer settlers was an attorney and landowner named Samuel P. Bailey (or Baily), who owned a couple parcels of land along the east and west shores toward the north end of the lake. M. H. Thompson’s 1864 wall plat map of Tazewell County shows Bailey’s property in what was then Cincinnati Township. Later the township boundaries were adjusted so that this land is now within Pekin Township, but, regardless of the township boundaries, even in 1864 the western portion of Bailey’s property was already within the Pekin city limits. 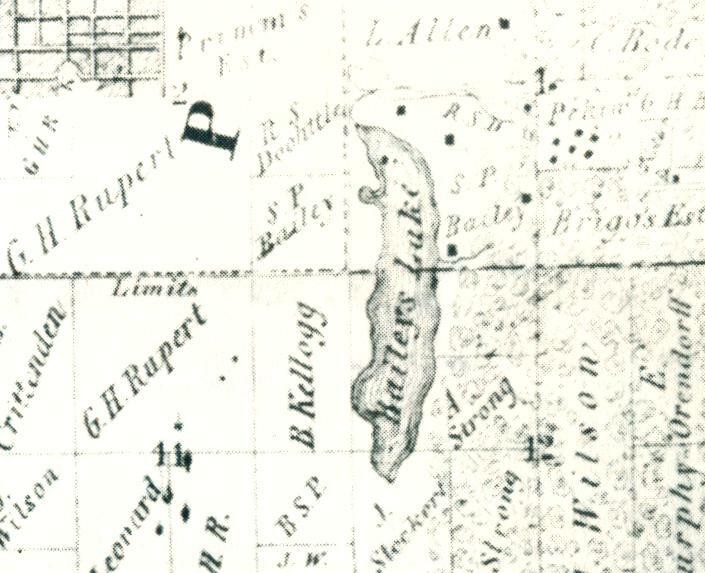 Bailey’s Lake and the land of Pekin attorney Samuel P. Bailey is shown in this detail from M. H. Thompson’s 1864 wall plat map of Tazewell County. The lake was renamed Lake Arlann in the 1950s, and about four years ago was again renamed Meyers Lake. In other words, Bailey knew a great deal, but wasn’t a very good lawyer. As much as we know about Bailey, can we discover as much about Arlann and Meyer?